TuneRS Motorsports provides complete manual transmission rebuilding for all Porsches. Our rebuilds are performed by our certified technicians at our facility in Coral Springs Florida. We are equipped with all of the up-to-date tools and equipment to complete these complex rebuilds and repairs. 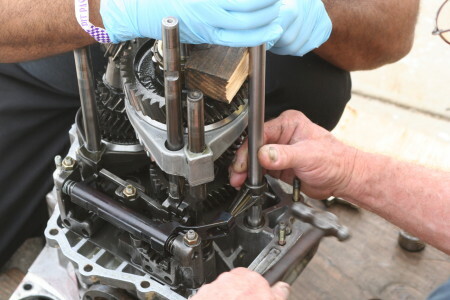 Rest assured that your transmission will be rebuilt using new OEM parts as that is standard in all of our rebuilds. Our technicians have many years of experience with Porsches on the track as well as with daily drivers. We have rebuilt transmissions ranging from early 901, 915 gearboxes to G50 transmissions up to today’s highly sophisticated PDK transmissions. Manual transmission rebuilds include replacement of clutches and flywheels. All clutches are Sachs clutch kits which come installed original from factory. We also offer upgraded sport and racing clutch kits for vehicle’s which require a stronger clutch and pressure plate to better absorb the duress of racing. Lightweight flywheels are also a great upgrade for motorsport and track vehicles. These flywheels weigh significantly less than a stock flywheel which help reduce the moment of inertia of the rotating components, thus providing much faster acceleration. Many club racers choose the light flywheel option along with a stronger clutch (sport, racing, heavy duty) and pressure plate. Additionally, many racers often request our TRS Transmission Oil Coolers as well to decrease temperature on the transmission which helps improve reliability. Additionally many clients elect to install the TRS IMS Direct Oil Feed to address the IMS bearing lubrication deficiency found on Carreras, Boxsters and Caymans built between 1997 and 2008. Important to understand that engines in Carrera GT3s and Turbo Carreras built during those years were designed differently and do not require this service. Furthermore, the IMS Direct Oil Feed upgrade is usually selected during a transmission rebuild because of the easy access to the IMS bearing after a transmission has been removed for a rebuild. While transmission lives vary from driver to driver. If you experience whining noises during acceleration, sticky gears while shifting, transmission popping out of gear, lack of acceleration when applying throttle, rpm’s “slipping”, clutch pedal engaging all the way at the top of the pedal then it is imperative you contact us immediately. In some instances your car may only need a minor adjustment and inspecting your transmission right away may also help you to prevent more damage to your car. It is always best to be proactive should you experience any of the warning signals listed earlier.